All the years, I had struggled to find out which hawker is the real 'Katong Laksa'. 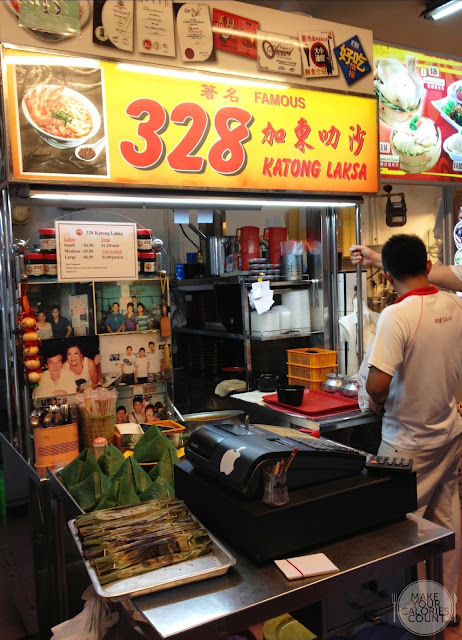 I did my research and while some effortlessly named 328 Katong Laksa, there were plenty who thought it was the Original Katong Laksa, who initiated the 'Janggut Laksa' trend where all you need was a spoon to scoop up all the goodness! For foodies, I think the paramount concern is which tastes better. With 328 Katong Laksa trumping Gordon Ramsay in the Singtel Hawker Heroes Challenge, we decided to put it to a test ourselves to see if they were indeed calories-worthy and more importantly a representation of our local food heritage. Despite my cynicism about the whole challenge, my belief is that if the ultimate objective is to campaign for greater awareness both locally and worldwide about our Singapore cuisine, then I pledge my support wholeheartedly. I quote Gordon Ramsay in his post-competition interview where he remarked 'Thank you to all the families, mums, dads and hawkers, without whom, I will not be here'. How true indeed. The recognition and focus should be channelled towards the other unnamed humble hawkers out there and not just the selected dishes nor participating hawkers. It had been years since I last travelled to the vicinity of the Katong/East Coast/Joo Chiat area for a proper food trail so on this occasion, I paid a special visit on foot and in the meantime giving appreciation to this part of Singapore which had a deeply rooted Peranakan influence. 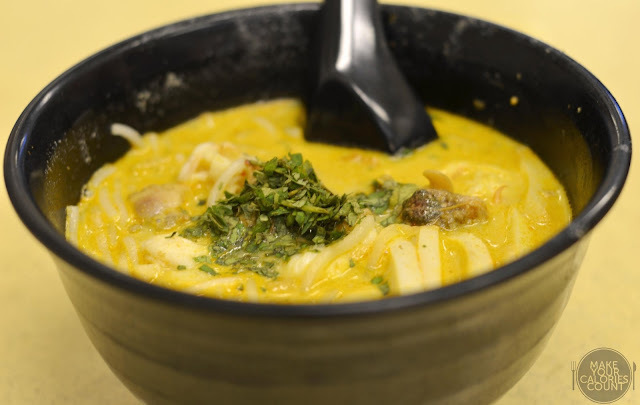 Locals and foreigners which travel to Katong area in search for laksa will almost certainly notice this flagship stall and a secondary outlet further down East Coast Road. 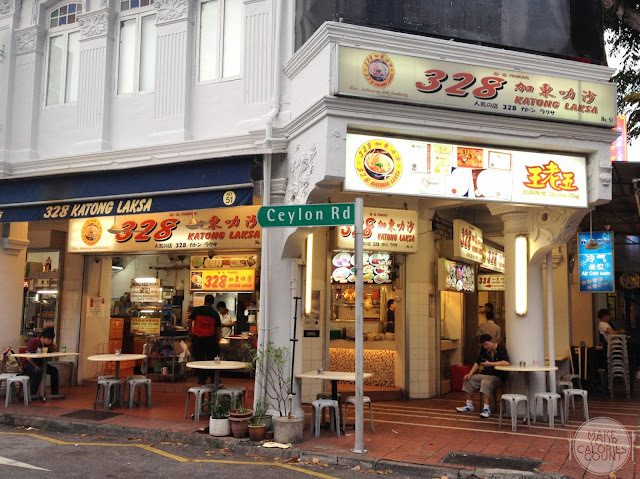 With both outlets possessing a prime location along the main road, one would naturally assume that 328 Katong Laksa is the original stall. There was an adjacent stall located beside this main outlet which had indoor air-conditioned seating. Upon placing the orders at the counter or with one of the staffs who would come to your table, the dishes would then be served to you. There were 3 sizes to choose from for the laksa with the smallest bowl priced at S$4.50, the medium for S$5.50 and the large at S$6.50. 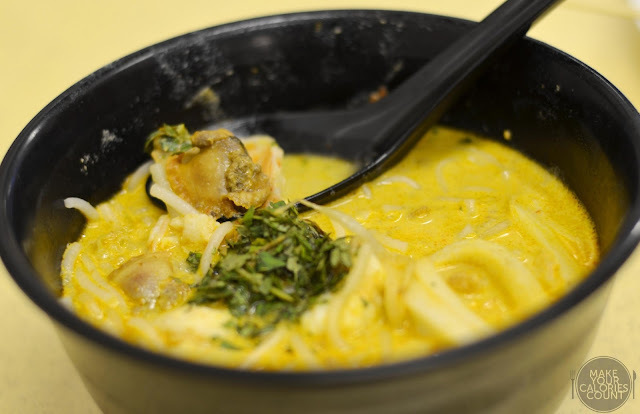 We thought it was relatively expensive compared to its competitor, the Original Katong Laksa which had their smallest offering starting from S$3. 'Slurp slurp! ', the first tasting of that coconut-based brought a smile to our faces immediately as we knew we were in for a good treat! There was a slightly gritty texture to that broth owed to the grounded dried prawns and spices. We particularly liked the densely rich flavours packed in that mildly sweet and spicy coconut curry soup base which delivered that much desired oomph. The balance in flavours was spot-on, with an initial creaminess, then a hint of the heat from the spices before a soothing richness from that coconut milk to round up a delectable spoonful. The thick vermicelli was served classic Janggut-style, where it had been thoughtfully cut so that all you need is a spoon to feed yourself to all the goodness contained in that bowl. The beautiful broth stirred our appetite and made us crave for more, only to build up a great disappointment. It is no rocket science that fresh ingredients make or break a dish and on this occasion, the prawns and cockles in this bowl was sub-standard. The cockles had a distasteful fishy smell and a gritty texture due to the presence of sand. The de-shelled and de-veined prawns tasted limp and lacked firmness. As an essential ingredient for the laksa stock came from the prawn heads, I was surprised that the prawns served were not fresh as expected. Quite frankly, we were divided in our verdict because we were blown away by that beautiful broth yet left disgruntled over the freshness of ingredients. Just some food titbits to takeaway with this, the pile of finely chopped laksa leaves, also known as Vietnamese coriander is an important ingredient contributing to the flavour of the broth. Apparently, it has the ability to repress sexual desires so many Buddhist monks grow this plant in their private gardens and eat it regularly as a helpful measure in their celibate life. Gentlemen, watch out. 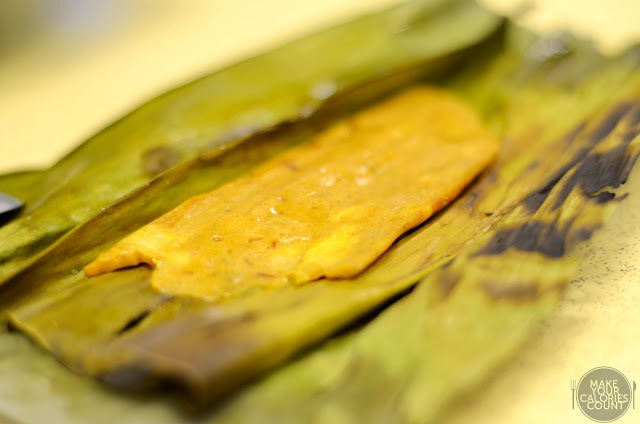 Unwrapping the banana leaves left a beautiful fragrance and revealed the fish otah, which is essentially a mixture of spices and fish meat. 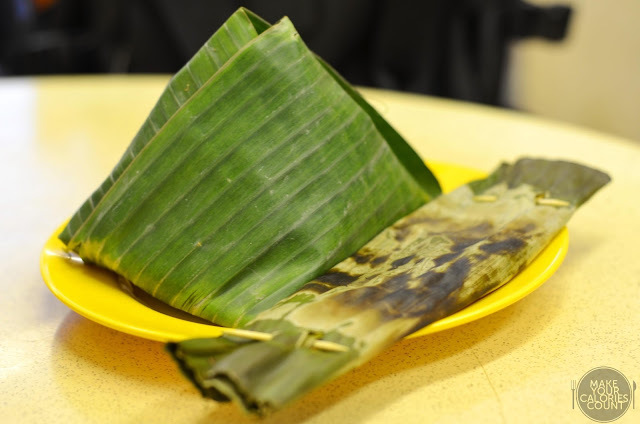 Typically, it is sliced thinly as shown in the picture, wrapped using a large banana leaf and slow-grilled over charcoal fire. It seemed like the perfect accompaniment for laksa or perhaps it was just a classic case of following my parents footsteps of enjoying laksa with otah. The otah retained moisture in the meat and tasted tender, succulent and most importantly fresh. Having tried one of the best Nasi Lemak at Kin Wah recently, I was on the prowl to find a good contender. This version came across as mediocre. 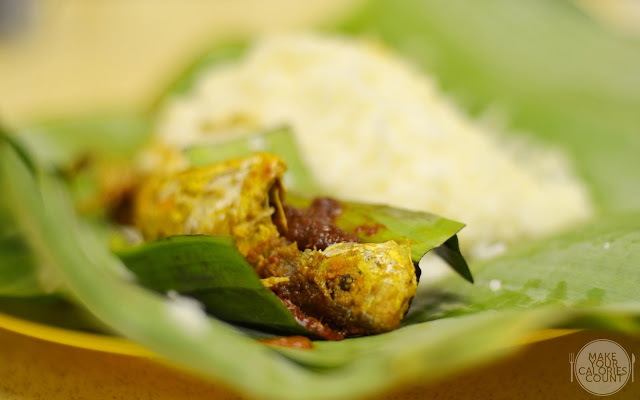 There was the typical deep-fried kuning fish but it was not crispy enough to consume it in entirety. The offering of peanuts and ikan bilis mixed in that sambal chilli was meagre and while the sambal chilli had a good kick, it failed to salvage the rice dish. There was a slight coconut fragrance in that rice but it was not strong enough for our preference. 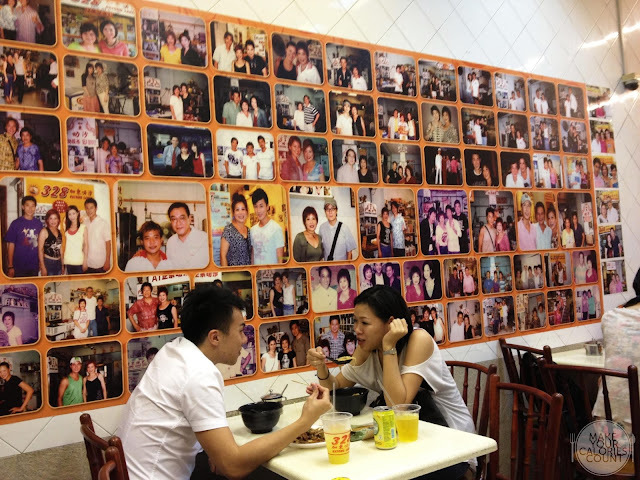 Photographs of visiting celebrities were plastered on both sides of the wall within the eatery. I know that 328 Katong Laksa is famous as it is, way before the Singtel Hawker Heroes Challenge but there was no need for their staffs to exude arrogance to customers. While waiting for my rojak order as it was self-service, there was a middle-aged lady who came for some takeaway orders. The gentleman serving her was impatient and quick to cut short her requests in packaging. While I did not fall victim as a Food Nazi on this instance, such customer service remained unacceptable by anyone's standards. Within the coffee shop itself, there was another chicken rice and rojak stall. 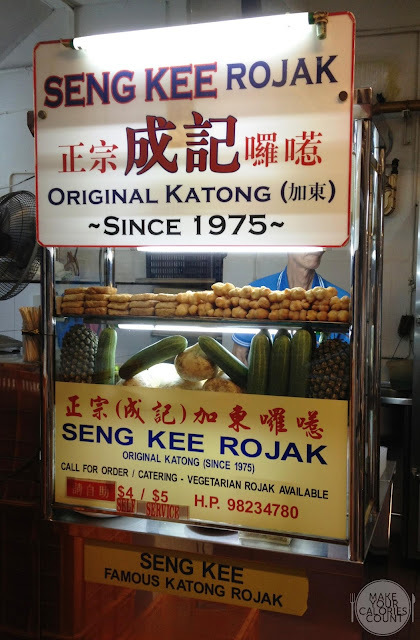 Since we had our mains, we decided to try the rojak, partly enticed by the billboard of its stall which read 'Since 1975'. In addition, I later learnt from the servers that the rojak stall is not related to 328 Katong Laksa but rather a separate establishment within the same coffee shop. 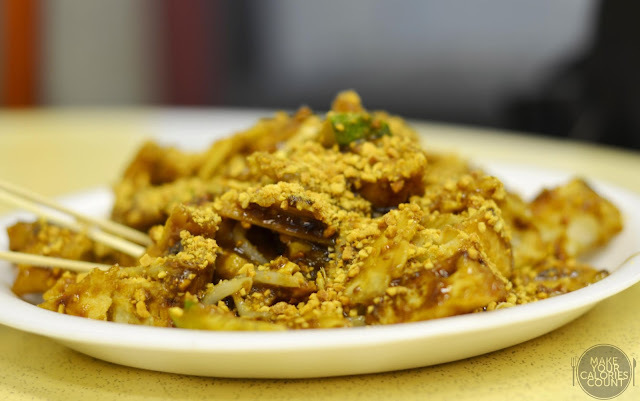 There were two sizes for the rojak and we settled for the smaller portion at S$4 while the upsized version came at S$5. I wish I could give a half-decent review but sadly my verdict was simple - do not waste your calories. The fritters (you tiao) was limp and soft while the shrimp paste was diluted, runny and lacked any strong unami flavours. When the key element of a dish turns out a disaster (the shrimp paste in this case), you know the dish is a mess. This was easily the worst plate of rojak tried in my life. Quite frankly, now that I had tried both versions of Katong Laksa, my preference lies with the Original Katong Laksa. The freshness of the ingredients and that equally sublime broth at lower prices coupled with better customer service simply won me over. Was it just me or did anyone realize that in the run-up to the Singtel Hawker Heroes Challenge, it was just Mr Ryan Koh from 328 Katong Laksa who ran the campaign solely. In a video interview, the confident 31-year-old chef even claimed that he had more experience than the 46-year-old gourmet chef, Gordon Ramsay who currently has 14 Michelin stars under his belt. Surprisingly, when Gordon made his appearance to 328 Katong Laksa flagship stall to learn about the preparation and cooking methods, it was Mr Ryan's mum and coincidentally the actual founder, Mdm Lucy Koh who stood up to be the teaching chef. It then became a mother-and-son effort, so who is Gordon's nemesis in this food challenge exactly? Food for thought, maybe?